If you hear scratching in your ceiling, crickets chirping in the walls, ants on the counters or roaches running around the house, count on Renegade Pest Control to handle these issues and any others that my occur. Our staff of well trained, knowledgable technicians use only the best products. Eco-friendly products are also available. Monthly, bi-monthly, quarterly and one-time services are available. Specialty services are priced accordingly. 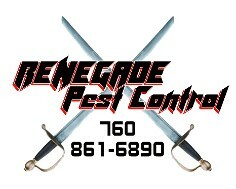 Contact Renegade Pest Control for more information about our residential and commercial pest control services.